NASA’s Mars Reconnaissance Orbiter (MRO) has discovered an impressive underground ice deposit beneath Utopia Planitia on the Red Planet that is estimated to contain as much water as Lake Superior, the largest of the Great Lakes of North America. By using the Italian-built SHARAD (Shallow Radar) instrument, the team was able to estimate that the deposit is between 80 and 170 meters (260 and 560 feet) thick, and it lies under a layer of soil up to 10 meters (33 feet) deep. The results are published in Geophysical Research Letters. 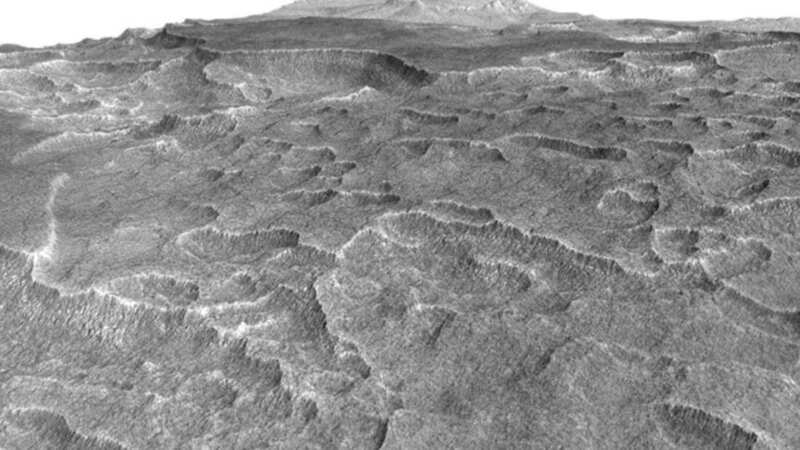 The deposit is believed to be less than 1 percent of all the water present on Mars, but its impressive features and relative abundance in a single location at mid-latitudes makes it an ideal target for exploration. “This deposit is probably more accessible than most water ice on Mars, because it is at a relatively low latitude and it lies in a flat, smooth area where landing a spacecraft would be easier than at some of the other areas with buried ice,” said co-author Jack Holt, from the University of Texas, Austin, in a statement. Utopia Planitia is a basin bigger than New Mexico, with a diameter of about 3,300 kilometers (2,050 miles). The formation of such a large reservoir at this relatively low latitude is due to the erratic behavior of the Martian axis. “This deposit probably formed as snowfall accumulating into an ice sheet mixed with dust during a period in Mars history when the planet’s axis was more tilted than it is today,” added lead author Cassie Stuurman, also from the University of Texas. The axial tilt is currently at 25 degrees, close to Earth’s own 23.5 degrees. But unlike our planet’s axis, the Martian axis varies between zero and 60 degrees over cycles 120,000 years long. During the Red Planet’s mysterious past, Utopia Planitia might have been where the current North Pole is.